Because we didn’t want anything from ’em, anyway! So HA. Yes, I’m making fun of Microsoft now. I heard that that’s what all cool kids do now-a days. And yes, maybe Microsoft released something, but not anything particular for IE, and that’s what matters. So the first stable releases of Opera 9.5 and Firefox 3 are out. 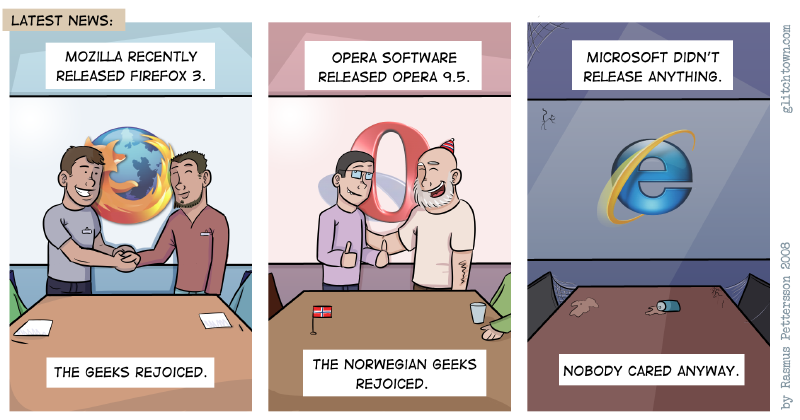 I myself use Opera, even though I’m no Norwegian geek (well… I guess I’m a Swedish geek, and that’s almost the same thing…). Anyhow, 9.5 is awesome. It’s working swimmingly, although it crashes sometimes when I shut it down. But that doesn’t matter then, anyway. I haven’t really used Fx3 that much, but it seems to as good as one can expect. But I really don’t like the look of it. Sorry about the sliiiiiiight delay on this one, I was working on it yesterday but had to shut down the computer do to thunder. This entry was posted on Monday, June 23rd, 2008 at 3:40 pm and is filed under Comic. You can follow any responses to this entry through the RSS 2.0 feed. Both comments and pings are currently closed. Good good Nick, seems like I have a lot of readers using Opera. We’re taking over the internet, starting here!